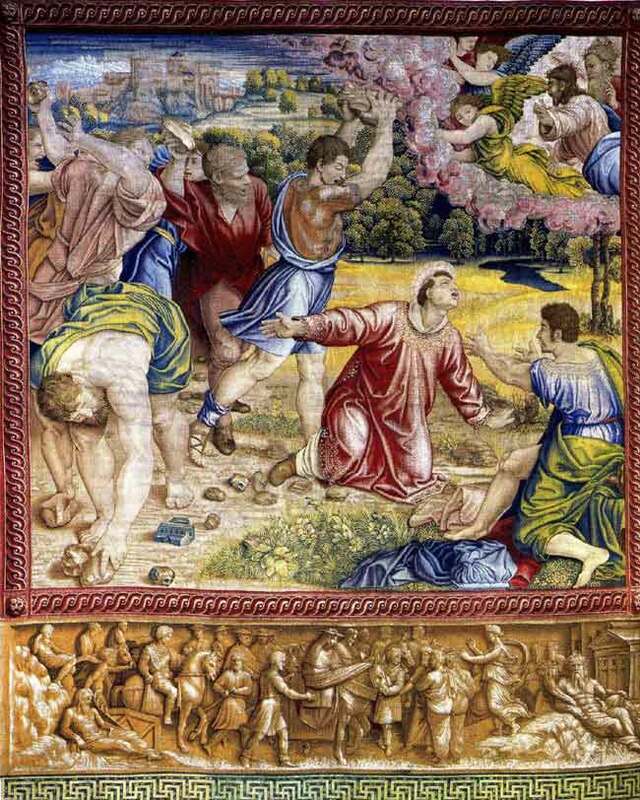 Sadly the Cartoon for The Stoning of Stephen has been lost and comparisons between the Cartoon and the Tapestry are not possible. However, the drama of the scene within the Tapestry gives us a flavour of the visual power that must have been present in the original painting by Raphael and his workshop. Stephen was a deacon of the Church. Appointed by the Apostles he was responsible for the distribution of goods to the poor. He was falsely accused of blasphemy. Stephen saw a vision of God the Father and Jesus but this did not prevent his accusers from taking him out and stoning him to death. The top right of the Tapestry clearly depicts Stephen's heavenly vision, he gazes skywards as his tormentors begin their execution ritual. In the lower right-hand corner of the work, a man sits guarding the garments of the executioners. This is Saul, the future St Paul before his conversion to Christianity.